For Hawaii, it’s 100%. Vermont, 70%. 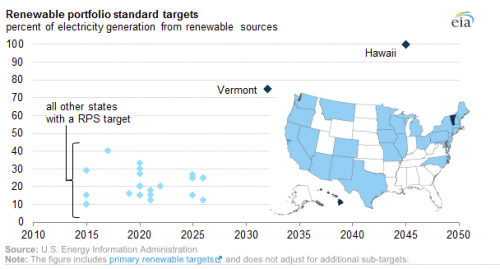 State by US state, renewable energy standards are increasing, partly as a response to climate change, partly because renewable energy provides autonomy and lower long term costs. The more sun, wind, or will that a state has, the quicker the change. If the savings succeed, it may become obvious to the other states that will have to either change or be left with high costs.